by Chris Woodford. Last updated: December 28, 2018. We're all used to the idea of boiling water to make tea or coffee, but what if you had to boil water every time you wanted to do anything? What if you had to make steam to charge your iPod, watch TV, or vacuum your carpet? It sounds crazy, yet it's not so far from the truth. Unless you're using renewable energy from something like a solar panel or a wind turbine, virtually every watt of power you consume comes from a power plant that generates electricity from boiling, hissing, rapidly expanding steam! We might not use piston-pushing steam engines to power our world anymore, but we still use their modern equivalents—steam turbines. What are they and how do they work? Let's take a closer look! 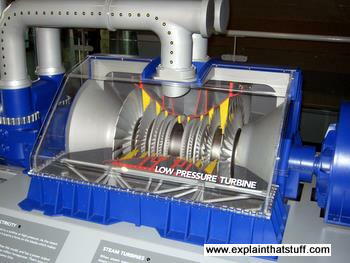 Photo: A one-tenth scale, cutaway model of a steam turbine at Think Tank, the science museum in Birmingham, England. Steam enters from the left through the gray pipe at the top, arriving in the very middle of the turbine and just above it. Then it simultaneously flows in both directions (to the left and the right) through the low-pressure reaction turbine, which drives the electricity generator on the right. Why does steam contain so much energy? If you've ever burned yourself with steam, you'll know it's incredibly painful—and much more so than an ordinary hot water burn. 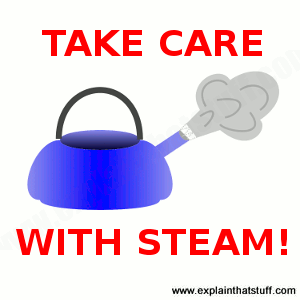 If water and steam are at the same temperature, why does steam hurt more? Simply because it contains much more energy. To turn 1kg (2.2lb) of water at 100°C (212°F) into 1kg of steam at the same temperature, you need to supply about 2257 kilojoules of energy, or roughly 1000 times as much as an electric kettle or toaster uses in one second. That's an absolutely huge amount of energy! It's what we call the latent heat of vaporization of water: it's the energy you have to supply to move the molecules in the water far enough apart to turn the boiling hot liquid into a hot gas. So why does steam hurt more? If 100°C boiling water hits your body, it cools down and gives up its heat; that's the energy that burns you. If 100°C steam hits your body, it first turns back to water and then cools down, burning you the same way as the hot water but also giving up the latent heat of vaporization to your body. It's this extra massive dose of heat energy that makes a steam burn so much more serious and painful than a hot water burn. On the positive side, this latent energy "hidden" in steam is what makes it so useful in steam engines and steam turbines! How does steam provide energy? If you've ever seen an old-fashioned steam locomotive, you'll have some idea just how powerful steam can be. A steam locomotive is built around a steam engine, a complex machine based on a simple idea: you can burn fuel (coal) to release the energy stored inside it. In a steam engine, coal burns in a furnace and releases heat, which boils water like a kettle and generates high-pressure steam. The steam feeds through a pipe into a cylinder with a tight fitting piston, which moves outward as the steam flows in—a bit like a bicycle pump working in reverse. As the steam expands to fill the cylinder, it cools down, loses pressure, and gives up its energy to the piston. The piston pushes the locomotive's wheels around before returning back into the cylinder so the whole process can be repeated. The steam isn't a source of energy: it's an energy-transporting fluid that helps to convert the energy locked inside coal into mechanical energy that propels a train. 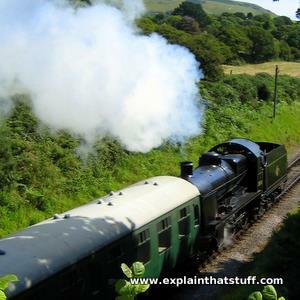 Photo: The power of steam: a restored locomotive running on the Swanage Railway in England. Expanding steam releases energy that drives the engine's pistons. It's pretty obvious that the steam leaving the chimney stills contains quite a bit of energy, which is one reason why engines like this are so very inefficient. Steam turbines usefully capture much more of the energy in steam—and are much more efficient. Steam engines were great: they powered the world throughout the Industrial Revolution from the 18th century right up to the middle of the 20th century. But they were huge, cumbersome, and relatively inefficient. A simple, steam-driven piston and cylinder is delivering energy to the machine it powers only 50 percent of the time (during the power stroke, when the steam is actually pushing it); the rest of the time, it's being pushed back into the cylinder by momentum ready for the next power stroke. Another problem is that pistons and cylinders make back and forth, push-pull, reciprocating motion, when (most of the time) what we'd really prefer is rotary motion—turning a wheel. To make up for these problems, steam engines have elaborately complex cylinders that allow steam in from different directions and heavy levers (cranks and connecting rods) to convert their push-pull reciprocating motion into rotary motion. Wouldn't it be better if we could directly power a wheel with the force of the steam, cutting out the pistons, cylinders, cranks, and all the rest? That's the basic idea behind a steam turbine, an energy converting device perfected by British engineer Sir Charles Parsons in the 1880s. A turbine is a spinning wheel that gets its energy from a gas or liquid moving past it. A windmill or a wind turbine takes energy from the wind, while a waterwheel or water turbine is usually driven by a river flowing over, under, or around it. Now you can't produce energy out of thin air: a basic law of physics called the conservation of energy tells us that a gas or liquid always slows down or changes direction when it flows past a turbine, losing at least as much energy as the turbine gains. Blow on the windmill stuck in your sandcastle and it spins around. What you can't see is that your breath slows down quite dramatically: on the other side of the windmill, the air from your mouth is traveling much slower! Read more in our introduction to turbines. Artwork: An early steam turbine design developed in 1888 by Swedish engineer Gustav de Laval (1845–1913). It works by directing straight-line jets of high-speed steam at a steel paddle wheel, with reasonable efficiency, so it's an example of an impulse turbine (explained below). Artwork believed to be in the public domain, from The Steam Turbine by Sir Charles Parsons, Cambridge University Press, 1911. As its name suggests, a steam turbine is powered by the energy in hot, gaseous steam—and works like a cross between a wind turbine and a water turbine. Like a wind turbine, it has spinning blades that turn when steam blows past them; like a water turbine, the blades fit snugly inside a sealed outer container so the steam is constrained and forced past them at speed. Steam turbines use high-pressure steam to turn electricity generators at incredibly high speeds, so they rotate much faster than either wind or water turbines. (A typical power plant steam turbine rotates at 1800–3600 rpm—about 100–200 times faster than the blades spin on a typical wind turbine, which needs to use a gearbox to drive a generator quickly enough to make electricity.) Just like in a steam engine, the steam expands and cools as it flows past a steam turbine's blades, giving up as much as possible of the energy it originally contained. But, unlike in a steam engine, the flow of the steam turns the blades continually: there's no push-pull action or waiting for a piston to return to position in the cylinder because steam is pushing the blades around all the time. A steam turbine is also much more compact than a steam engine: spinning blades allow steam to expand and drive a machine in a much smaller space than a piston-cylinder-crank arrangement would need. That's one reason why steam turbines were quickly adopted for powering ships, where space was very limited. All steam turbines have the same basic parts, though there's a lot of variation in how they're arranged. Photo: Steam turbine blades look a bit like propeller blades but are made from high-performance alloys because the steam flowing past is hot, at high pressure, and traveling fast. Photo of a turbine blade exhibited at Think Tank, the science museum in Birmingham, England. Running through the center of the turbine is a sturdy axle called the rotor, which is what takes power from the turbine to an electricity generator (or whatever else the turbine is driving). The blades are the most important part of a turbine: their design is crucial in capturing as much energy from the steam as possible and converting it into rotational energy by spinning the rotor round. All turbines have a set of rotating blades attached to the rotor and spin it around as steam hits them. The blades and the rotor are completely enclosed in a very sturdy, alloy steel outer case (one capable of withstanding high pressures and temperatures). In an alternative design called a reaction turbine, there's a second set of stationary blades attached to the inside of the turbine case. These help to speed up and direct the steam onto the rotating blades at just the right angle, before it leaves with reduced temperature and pressure but broadly the same speed as it had when it entered. In both cases, steam expands and gives up some of its energy as it passes through the turbine. In an ideal world, all the heat and kinetic energy lost by the steam would be gained by the turbine and converted into useful kinetic energy (making it spin around). But, of course, the turbine will heat up somewhat, some steam might leak out, and there are various other reasons why turbines (like all other machines) are never 100 percent efficient. Photo: Impulse and reaction. 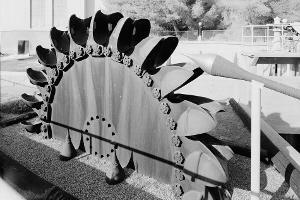 1) This Pelton water wheel is an example of an impulse turbine. It spins as a high-pressure water jet fires into the buckets around the edge from the nozzle on the right. Steam impulse turbines work a bit like this. Photo by Jet Lowe, courtesy of Historic American Buildings Survey/Historic American Engineering Record/Historic American Landscapes Survey, US Library of Congress, believed to be in the public domain. 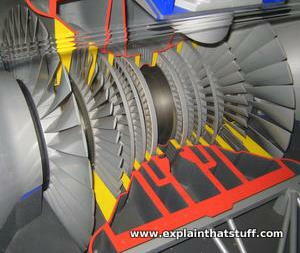 2) A reaction turbine turns when steam hits its curved blades. Photo by Henry Price courtesy of US Department of Energy/National Renewable Energy Laboratory (DOE/NREL). Apart from the rotor and its blades, a turbine also needs some sort of steam inlet (usually a set of nozzles that direct steam onto either the stationary or rotating blades). Steam turbines also need some form of control mechanism that regulates their speed, so they generate as much or as little power as needed at any particular time. Most steam turbines are in huge power plants driven by enormous furnaces and it's not easy to reduce the amount of heat they produce. On the other hand, the demand (load) on a power plant—how much electricity it needs to make—can vary dramatically and relatively quickly. So steam turbines need to cope with fluctuating output even though their steam input may be relatively constant. The simplest way to regulate the speed is using valves that release some of the steam that would otherwise go through the turbine. "I therefore decided to split up the fall of pressure of the steam into small fractional expansions over a large number of turbines in series so that the velocity of the steam nowhere should be great." Sir Charles Parsons, The Steam Turbine, 1911. Photo: The multiple stages in a typical steam turbine. This model is at Think Tank, the science museum in Birmingham, England. In practice, steam turbines are a bit more complex than we've suggested so far. Instead of a single set of blades on the rotor, there are usually a number of different sets, each one helping to extract a little bit more energy from the steam before it's exhausted. Each set of blades is called a stage and works by either impulse or reaction, and a typical turbine can have a mixture of impulse and reaction stages, all mounted on the same rotor axle and all turning the generator at the same time. Often the impulse stages come first and extract energy from the steam when it's at high pressure; the reaction stages come later and remove extra energy from the steam when it's expanded to a bigger volume and lower pressure using longer, bigger blades. 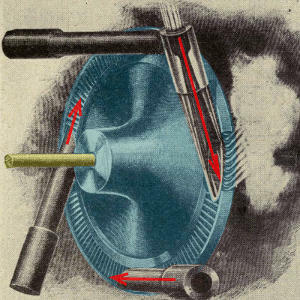 The multi-stage approach, invented by Charles Parsons, means each stage is slowing or reducing the pressure of the steam by only a relatively small amount, which reduces the forces on the blades (an important consideration for a machine that may have to run for years without stopping) and greatly improves the turbine's overall power output. Photo: Multiple stages (closeup): Zooming in on the photo above, you can see how each stage is bigger than the previous one: bigger in diameter, more widely spaced, with bigger blades set at greater angles that have wider openings in between them. This allows the steam to expand gradually on its journey through the turbine, which is how it gives up its energy. You can see the same thing even more clearly if you check out this wonderful photo of an old dual-flow Siemens steam turbine from a nuclear plant. Turbines also vary in how they cool the steam that passes through them. Condensing turbines (used in large power plants to generate electricity) turn the steam at least partly to water using condensers and giant concrete cooling towers. This allows the steam to expand more and helps the turbine extract the maximum energy from it, making the electricity generating process much more efficient. A large supply of cold water is needed to condense the steam, and that's why electricity plants with condensing turbines are often built next to large rivers. Noncondensing turbines don't cool the steam so much, and use the heat remaining in it to make hot water in a system known as combined heat and power (CHP or cogeneration). Practical steam turbines come in all shapes and sizes and produce power ranging from one or two megawatts (roughly the same output as a single wind turbine) up to 1,000 megawatts or more (the output from a large power plant, equivalent to 500–1000 wind turbines working at full capacity). In the biggest turbines, in large fossil-fuel power plants, the steam pressure can be as high as 20–30MPa (3000–4000 psi or about 200–270 times atmospheric pressure). A small, 10 megawatt steam turbine is roughly the same size as a Greyhound bus (a large single-deck passenger coach). Photo: Cooling towers like these help a steam turbine condense steam to extract more energy. If you're uncertain why we need cooling towers, check out The Energy Cost of Heat by David MacKay, an extract from his excellent book Sustainable Energy: Without Hot Air. 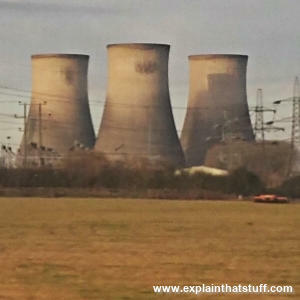 These are the towers at Didcot power station near Oxford, England. How can you make a better steam turbine? I had a great email from a student recently who was doing a science fair project with steam turbines. He wanted to know how he could improve a model turbine he'd built to get more energy out of it. The first thing to note is that steam can be incredibly dangerous (for the reasons outlined in the box up above): it contains a huge amount of energy that will burn you very badly if you touch it. So do be very careful if you're doing experiments with steam turbines and steam engines. However, for exactly the same reason, steam is incredibly useful: if we harness the energy it contains, we can do extraordinary things—like driving ships and locomotives or generating electricity. The Industrial Revolution that powered the world through the 18th and 19th centuries largely ran on the power of boiling water. That's an amazing thought! The next important thing to consider is the law of conservation of energy, which tells us that you can't get any more energy out of something than you put into it. If you have a steam turbine that's 100 percent efficient, it converts all the energy in the incoming steam into mechanical energy in the turbine (in other words, kinetic energy in the wheel that's spinning around). Although steam turbines are efficient, they're nothing like this good: most are about 30 efficient, which means they capture 30 percent of the energy from the incoming steam and waste the rest. That sounds poor, but it's about three times better than an ordinary steam engine, which is typically less than 10 percent efficient! Logically, you can see there are two ways to get more energy out of a steam turbine: put more energy in or improve the efficiency. Putting in more energy is the easy option. You could simply scale everything up: build a bigger turbine with bigger wheels and vanes inside it and bigger pipes carrying in more steam from a bigger fire. You'd get more energy out because more energy would be going in, but you wouldn't get any improvement in efficiency. If you made a turbine twice as big, you'd theoretically get twice as much energy out of it, but you'd also waste twice as much energy too! The other option is to work on getting more energy out of the steam that you feed in by redesigning the turbine itself. Is a reaction turbine better than an impulse turbine? How many blades work best? What shape should the blades be and what angle should they make? Can you make the turbine lighter (so it spins faster) but still strong enough to withstand the heat? Can you use multiple stages to extract energy that would otherwise be wasted? Can you reduce heat losses (by insulating the machine)? The main thing to remember is that you cannot defy the law of physics: any extra energy you want to produce must come from somewhere—either by putting in more energy or by improving efficiency. The Power of Heat is Right Under Your Feet: This great science fair activity from Science Buddies involves building a simple stove-top heat turbine. Please be sure to follow the safety instructions very carefully. The Steam Turbine: The Rede Lecture 1911 by Sir Charles Parsons. A fascinating lecture by the pioneer of steam turbine technology. Includes Parsons' own explanation of how a turbine works with helpful photos and sketches. Combined-Cycle Gas & Steam Turbine Power Plants by Rolf Kehlhofer et al. PennWell Books, 2009. Contains lots of detailed technical information about high-efficiency power plant steam turbines. Steam Turbines for Modern Fossil-fuel Power Plants by Aleksandr Shaulovich Leizerovich. Fairmont, 2008. Explains the importance and history of steam turbines, then looks at their design, operation, and maintenance. Concludes with a section on ways of extending the life of aging turbines. Steam Turbines: Design, Applications, and Rerating by Heinz P. Bloch and Murari P. Singh. McGraw-Hill Professional, 2008. An up-to-date volume intended for engineers working in the power industry. A Practical Guide to Steam Turbine Technology by Heinz P. Bloch. McGraw-Hill Professional, 1996. Explains what turbines are and the different types before looking at the various components of turbines (including casings, bearings, rotors, blades, governors, and control systems) in more detail. Mainly designed for power plant engineers. Want Efficient Energy? Try Carbon Dioxide-Powered Turbines by Nick Stockton. Wired, May 26, 2017. Why using carbon dioxide gas to produce energy in turbines could be smarter than using steam. Graphene Coating Could Save Millions in Power Plant Energy Costs by Dexter Johnson. IEEE Spectrum, Jun 4, 2015. Graphene-coated condensers could greatly improve power plant efficiency, MIT researchers find. Inside a turbine at Indian Point by Edward Hudson. The New York Times, February 8, 1981. This old (but still relevant) article from the Times archive explains how a single broken steam turbine blade caused massive disruption at the Indian Point nuclear plant. US Patent 475,957: Steam turbine by George J. Altham, issued May 31, 1892. An old-fashioned impulse turbine from the late 19th century. US Patent 746,388: Steam turbine by Theodore Scheffler, issued December 8, 1903. I think this one is a multi-stage reaction turbine. US Patent 777,313: Steam turbine by John W. Smith, issued December 13, 1904. 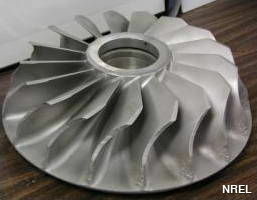 Describes a multi-stage impulse turbine in which small buckets are powered by steam from a nozzle. US Patent 4,329,592: Steam turbine control by James B. Wagner, General Electric Company, issued May 11, 1982. Describes the control system for a steam turbine in a modern power plant. US Patent 2010/0166548 A1: Steam turbine blade and method for manufacturing same by Akio Sayano et al, Kabushiki Kaisha Toshiba, issued December 17, 2009. This patent goes into quite a bit of detail about the design and construction of turbine blades, including the sorts of composite materials needed to withstand high temperatures and pressures.